Tiffany Dehen is a 2016 alumna of University of San Diego’s law school. Her website declares that she is “a true American and Patriotic Trump Supporter,” and her photo album includes a photo of her smiling with Dinesh D’Souza. 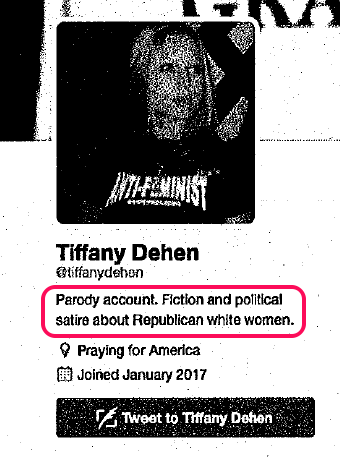 She claims that an unidentified person created a “parody” Twitter account that used her photo and posted objectionable content. She reported the account to Twitter and, after a few days, the account was disabled. You can read more about her motivations for filing this lawsuit in an Above the Law interview. Dehen sued several defendants; I’ll focus on Twitter’s liability. As a result, the court dismissed the claims against Twitter and will tax costs against her. On the plus side, Twitter brought a motion to dismiss rather than an anti-SLAPP motion to strike, so Dehen may avoid paying Twitter’s legal fees. This case reminded me of two other cases. First, Franco Caraccioli’s lawsuit against Facebook analogously involved a negative social media account targeting a San Diego law student that took longer than expected to be removed. Is something going on in San Diego? Like Caraccioli, Dehen’s lawsuit met a quick Section 230 dismissal, and attempts to use a breach-of-contract workaround failed. Second, the case reminds me of the seminal Zeran v. AOL case, which also involved the allegedly slow removal of attack impersonation accounts. In that case, Zeran tried to frame AOL’s (allegedly) slow removal of the accounts as negligence, but it also didn’t change the Section 230 outcome. Case citation: Dehen v. Doe, 2018 WL 4502336 (S.D. Cal. Sept. 18, 2018). Dehen’s website has an archive of case filings.